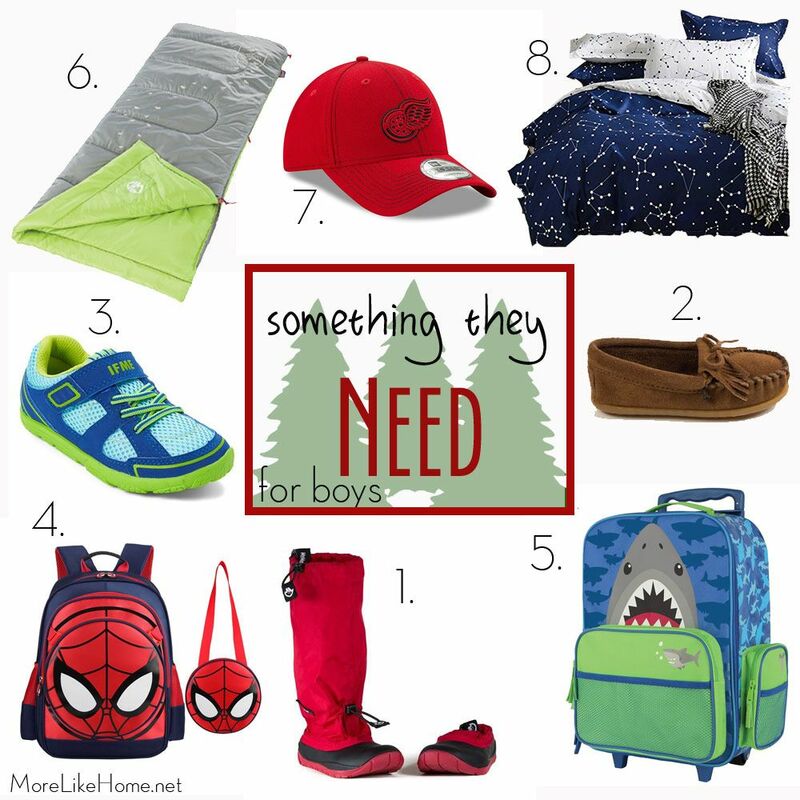 Check out our gift guide for the ladies here, and for the guys here. Christmas is less than two months away! 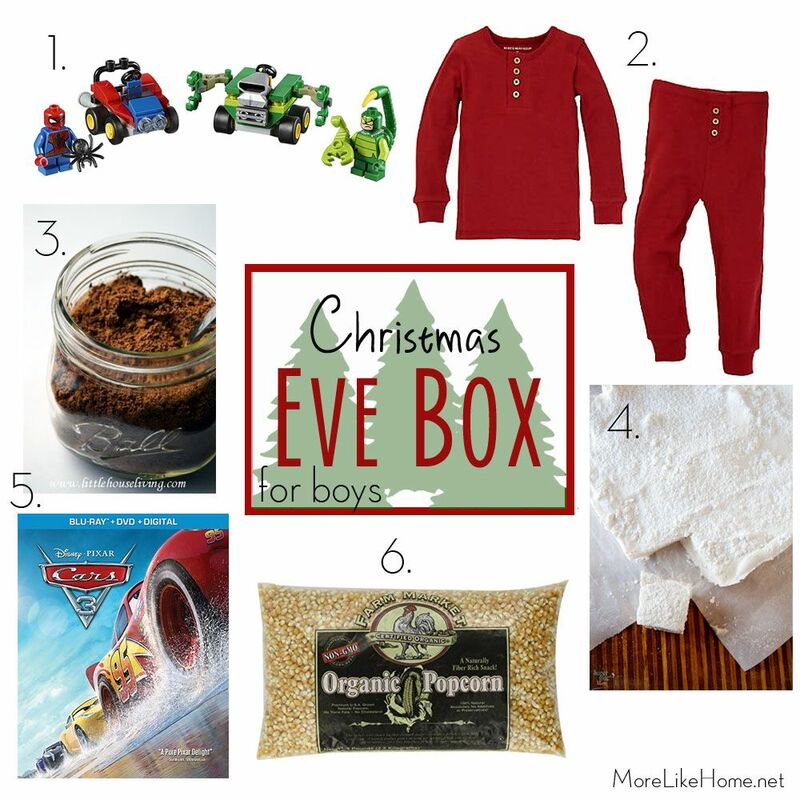 I don't know about you, I've been running our Christmas shopping plans through my head for a few weeks, and I'm ready to start checking off those mental lists.We have a few years of experience under our belts when it comes to shopping for boys, so we thought we'd share a rundown of some of our favorite gifts for these little fellas to help give you a jump start on your shopping, too! Play Food - always a big hit at our house, and they've had their eyes on this pasta set. Wooden Blocks - this set includes a storage box! Animals - we like the the larger animals by Safari Ltd (like the mama and baby bear), but the Toob sets would also be great for a stocking! Peg Doll Playsets - you can find these on etsy or make your own! We made a little camping set that our boys love, but you could do whatever interests them - superheroes, knights with a felt castle, even animals (I'm working on a raccoon family with a felt log for boy #3's birthday)! Small Slide - this slide has been going strong for several years with our boys. We even bring it inside for the winter so they can slide off some energy. They use it daily! Indoor Swings - this is another of those "burn off energy in the winter" items. Boys gotta move. I would love to get this doorway swing and climbing set, and my boys would get a kick out of a pod swing. Climbing Things - our boys love the climbing dome in our backyard. And the mama would love to add some indoor climbing options for winter (it's my theme this year). 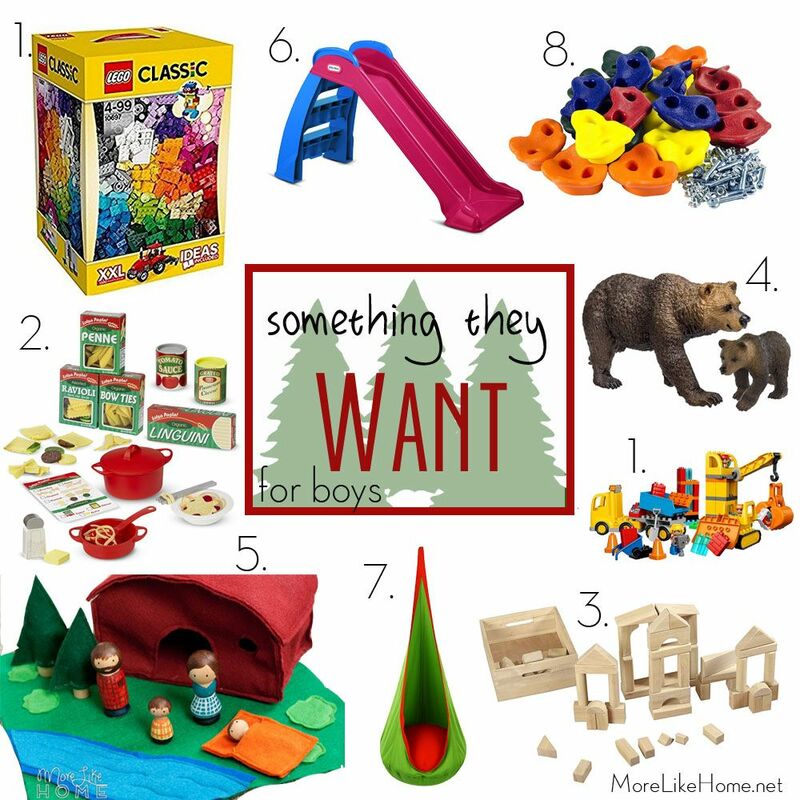 My wishlist includes putting in monkey bars over the bed, some rockwall holds up the wall in their room (I like the ones that look like real rocks), or a ninja slackline. This is a really broad category, because what your kids need may be very different than what mine need! We've also put things they want that will be really useful into this category. Sometimes we end up a more boring item like shoes, and sometimes it's something fun like a sleeping bag or backpack. But remember, only one! That's the hard part. Boots - My Mayu Boots are my favorite because they are so flexible and good for little feet! But they are a little pricey, so I've only splurged for them as a Christmas "need." 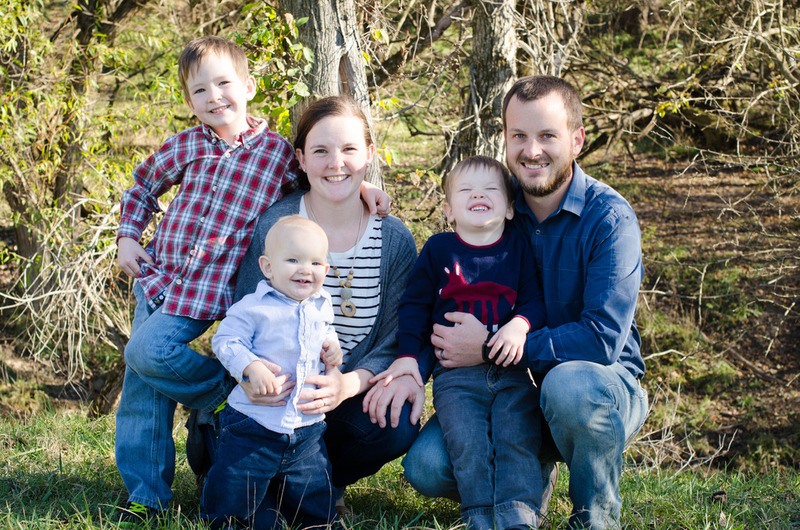 It helps that we have three boys and can will be able to pass them down the line, so for now we only need to buy for the biggest boy. I also buy the liners so they will be warmer for winter. Shoes - let's just start with all the shoes, because this tends to be our biggest need for all these boys. I haven't tried these yet, but Minnetonka Moccasins are supposed to be really flexible and foot-friendly, too. I'd love to get a pair for the big boy (he's the hardest to find good shoes for). More Shoes - We bought IFME Scout Shoes last year and I L.O.V.E. them. 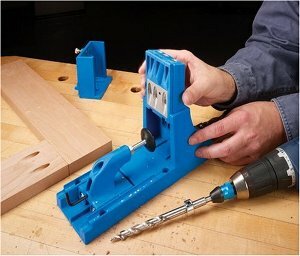 I planned to buy them again, but they're proving hard to find in the U.S. They're only available at brick & mortar stores, and the one I bought them at closed. Boo. But I definitely recommend them if they are sold in your area. This category often overlaps our "need" items, since we tend to need shoes, but they can also go into the wear category if there is something else you need! We usually end up with t-shirts or hoodies featuring their current favorite theme (this is the year of Star Wars). Themed T-Shirts - our go-to "wear" gift. We've already picked up a couple Star Wars sweatshirts for the big boys. (lightsaber tee here). Hoodie/Jacket - our other go-to, because they feel amazing when they wear hoodies. (BB8 hoodie here). A Coat - this is a great chance to splurge on a super cozy coat (and maybe some snow pants?) to keep those little guys toasty in the snow. They probably need to spend more time in the snow anyway. (blue/yellow columbia coat here). Magazines - magazine subscriptions are the gifts that keep on giving! Our boys love finding the new issue each month. We especially like Clubhouse Jr. because it's faith-based and full of stories with a positive message, and Highlights (or High Five for littler kids) that's packed with short stories, puzzles, craft projects, and even easy recipes. Altoid Tin Toys - these are just the right size, and great to have on hand for long drives or long waits. You can find them on etsy or make you're own! (I'll be sharing the tutorial for this Ewok/Bear set next week, you'll be able to find it here). 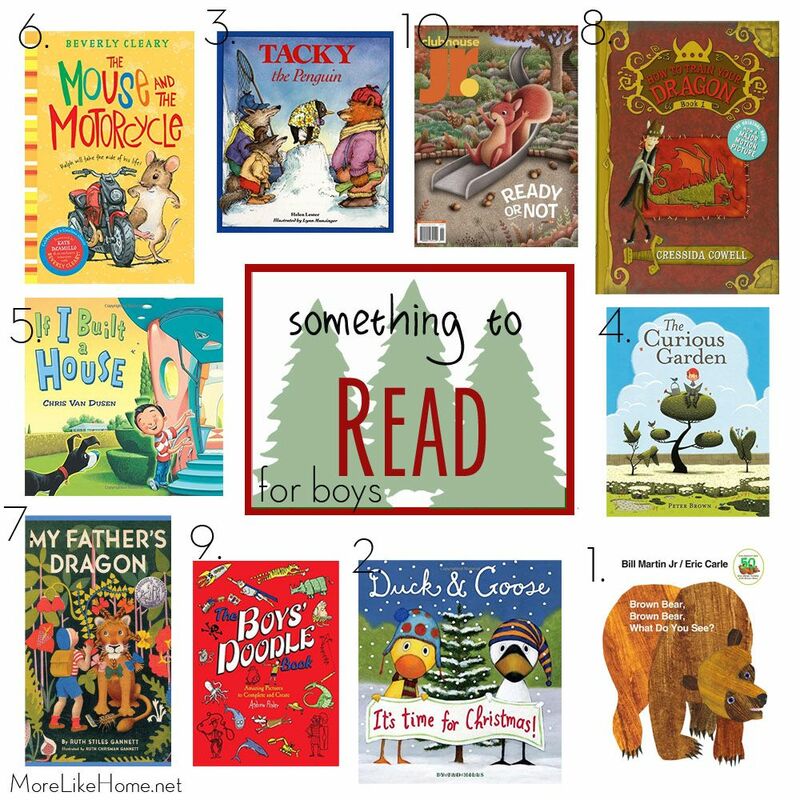 The last big part of our gift giving is teaching our boys to give back. They help with small gifts for family members (last year they made penguin cup cozies for everyone, and are already working on this year's surprise! 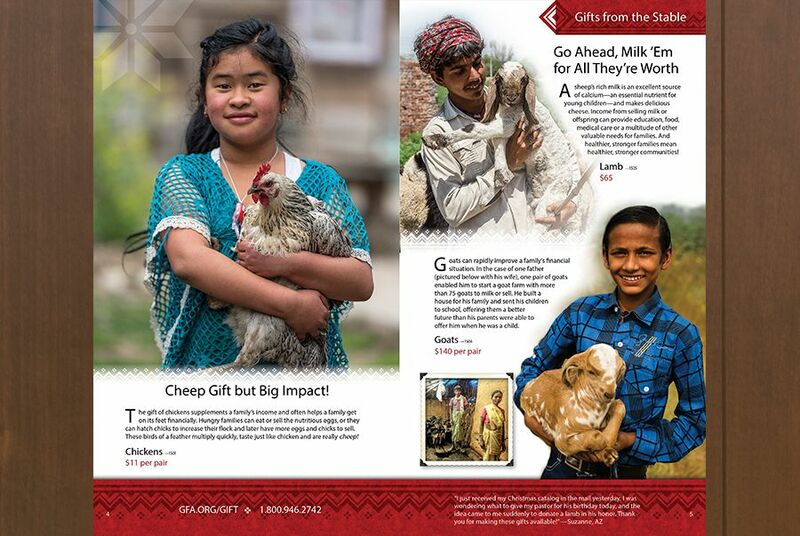 ), and we also have a family meeting to pick out donation items from the Gospel for Asia catalog. We set a budget before we start and give as much as we can. 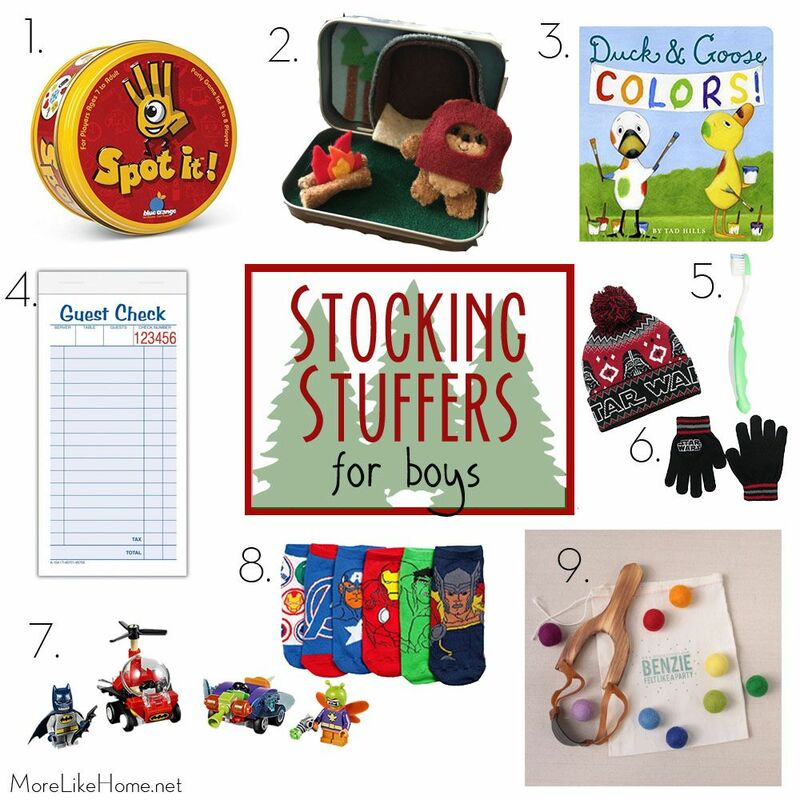 The boys love flipping through to find the items they think will make the best gifts. Spoiler: it always involves bunnies. 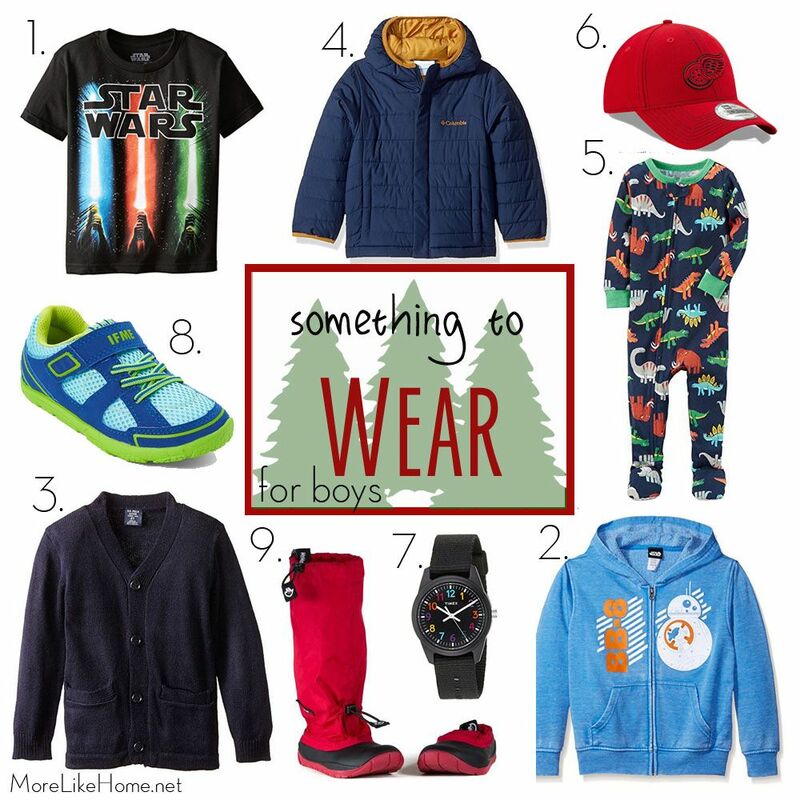 What are your favorite gifts for boys?